Finally a good solution for the new Olympic cat. 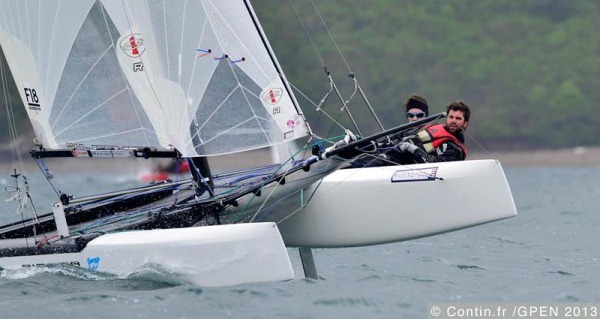 After a failing with an in house built, Nacra went to a carbon spar specialist to get things done in the right way for the requirements needed for an Olympic campaign. After finishing his studies at South Hampton Ferdinand van West, is now working for Nacra and he is making some detailed tests to the new mast before being distributed to the already delivered N17s. 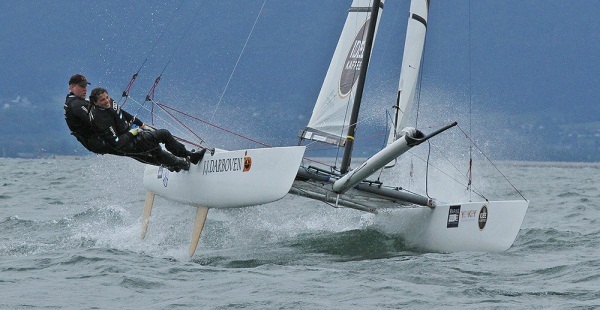 Having Hall Spars involved it is really good news for the Olympic sailors. Nice step forward for the Class. A group of talented young sailors missing an incredible opportunity in their pocket due to some suit guys was a truly bad situation for the them. But they are back and they'll race the 45s at San Francisco, and I'm glad for them. 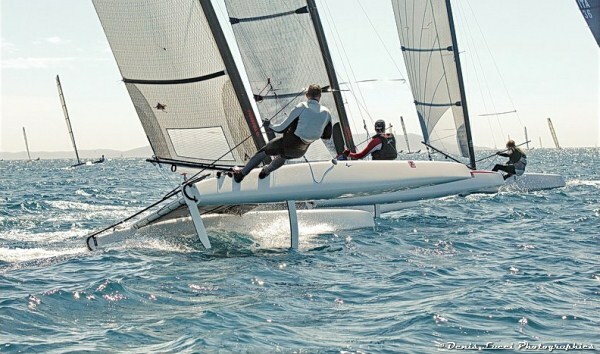 19yr old designer Raphael Censier testing a legal conf in his own built and designed A-Cat. 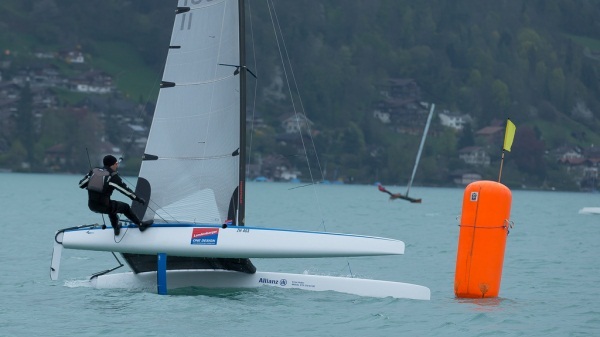 He found 10 free days between his studies to build his three missing foils. Two L rudders a la Fischer and the remaning C board , conf respecting Class rules. Sent by Alex Udin / Sail Innovation. 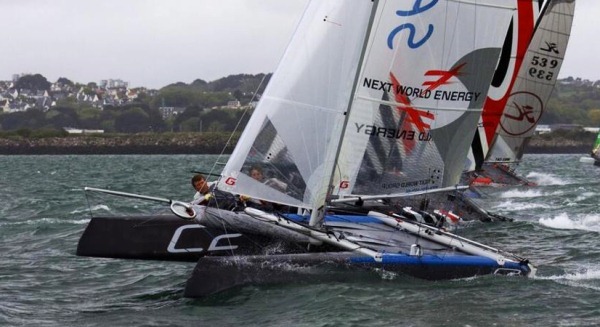 Foiling no spi a la ETNZ & Luna Rossa AC72. The Moths are getting themselves a future rival with all the cat flying projects going around. Forget about any technical analysis , this is just pure adrenaline fun. They claim 26,5 Knots in 9-11Knots True wind. All Images Alain Rumeau. 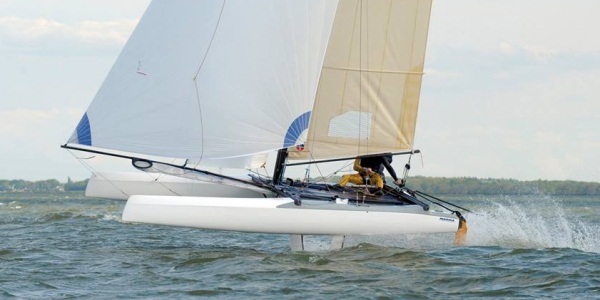 Full Gallery here -- Hobie continues to provide alternatives to the entire range of sailors, from kids with the Dragoon to youth and mixed crews in the H16 to those looking for a higher level with the Wildcat F18. Sequence Denis Lucci. -- Mischa Heemskerk is current A-Class World Champ, he is also top F18 contender for years now with Bastian Tentij. 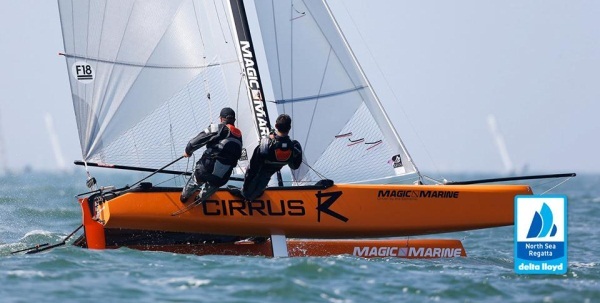 Today they won the F18 North Sea Regatta on the Cirrus R and Mischa's own sails. 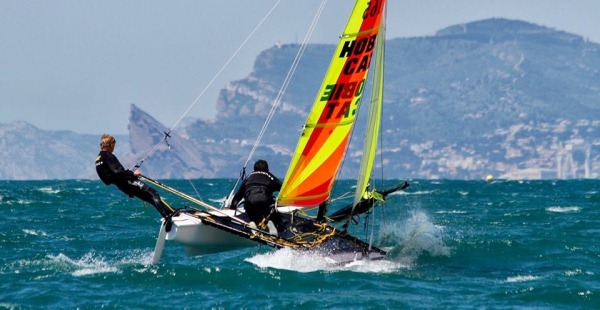 Together they are also training with the Hydros team along Billy Besson&Jeremie Lagarrigue) to compete in the C-Class major event. I published earlier this week some great images and flight sequence by Denis Lucci on Mischa having the first documented stable flight on a legal A-Class. 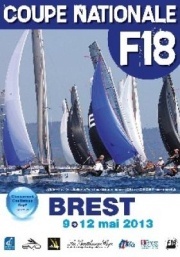 2013.f18worlds.com After a first successful event in America with 120 boats, the Class returns to Europe. 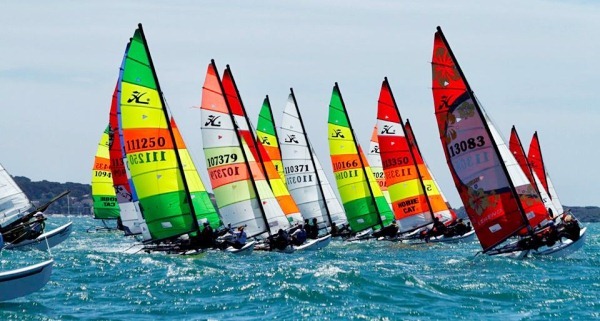 Italy will host this edition at Marina di Grossetto and 165 boats Confirmed (check link below) and surely more will be entering their registration soon. Remember we are in the Open period, so first come first served. 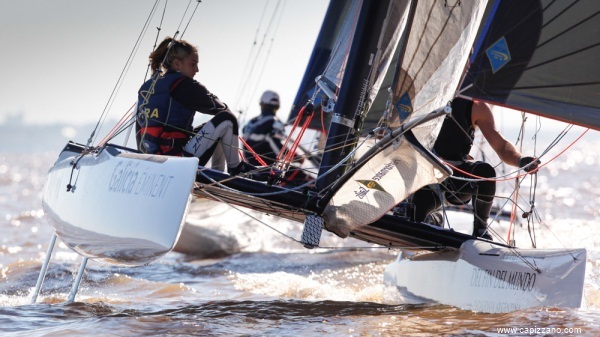 Arg will be sending 6 crews at least and one Uru crew working on getting the boat. 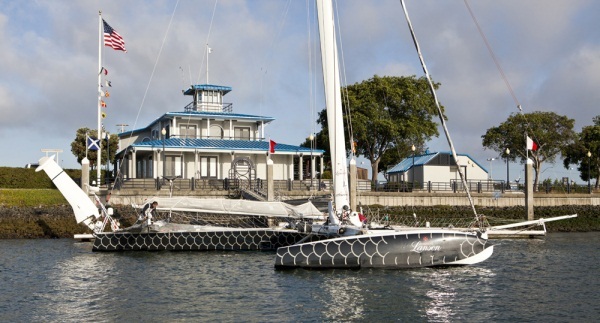 - Wanted: Brand new Hobie Wildcat to be delivered at Grossetto before the Worlds. - Offered: 1 Windrush Edge available to charter. And others to be sold after the Worlds. If interested or you know someone who does, contact me and I'll will contact you directly with them. 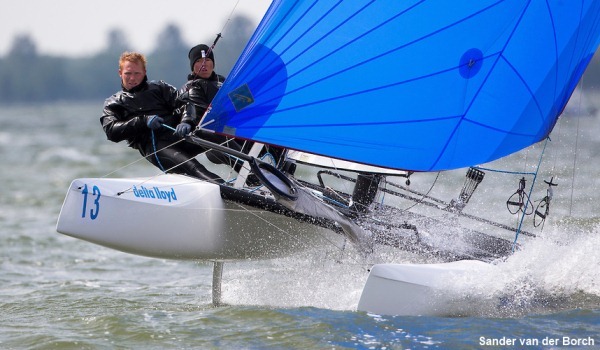 North Sea Regatta ended as reported in previous F18 post, Mischa Heemskerk-Bastian Tentij won, as no race today due to lack of wind. "With light winds early in the morning the postponement flag went up for the Tornado Class and the sailors remained on shore watching the A Class’ float out to their racing area. 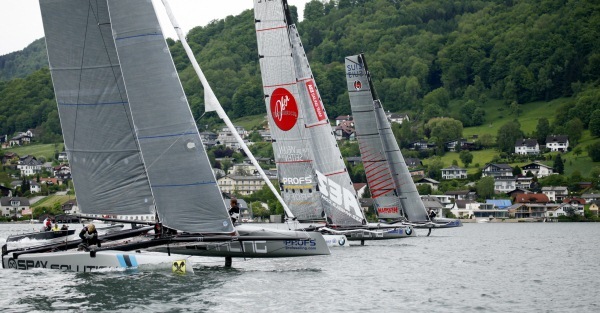 Around 1 hour later the race officer removed the postponement and the sailors got ready and went out onto the water. 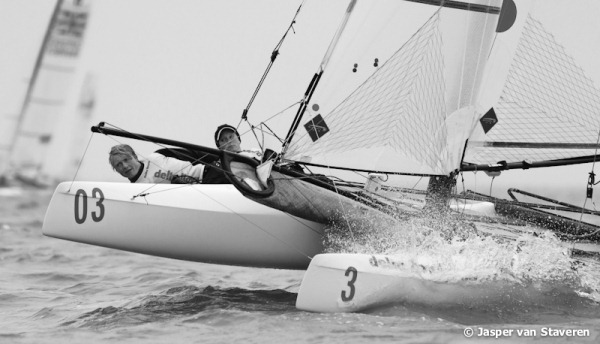 It was Roland and Nahid Gaebler who held the lead going into the last day and they were hoping there would be no racing because the Greek team of Iordanis and Kostas could discard a 5th if there was further racing in the championship. 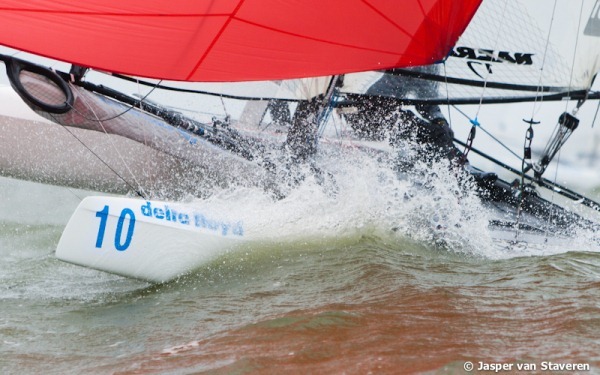 The forecast was always due to be bad for the third day of racing and the sailors awoke to a fresh force 4 wind with heavy cloud cover. When it was time to hit the water the wind was building with choppy water and big waves. The race officer got the fleet off to a quick start for the first race, another clean start. 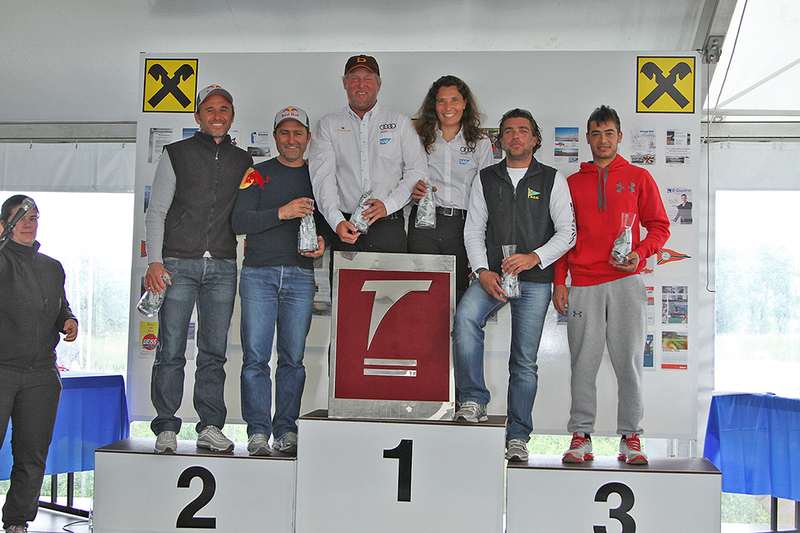 It was Iordanis Paschalidis and Kostas Trigonis who led the fleet all the way round the race course to take victory. 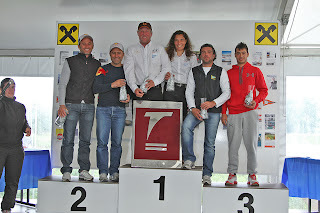 They were followed by the Gaeblers in 2nd and Nikos and Alex (GRE 11) in 3rd position. Image by Carlo Borlenghi. Time to sail again. Although as Bundy is remarking, holding a press conf dedicated to safety and not following the expert panel recommendations on not to sail until further notice is at least strange. But well it is part of the mind / political games, ACup stuff as usual. Is their right and their choice, Racing mode is On again for LR. Luna Rossa will race. Bertelli Stament: Common Sense & Sailors safety. The right words were spoken by Patrizio Bertelli in this case focusing on the security of his team. Sailors are main asset, and all should revolve now around them. This is no kamikaze game, and only them should decide whether to race or not beyond any possible indication they might get from the management. The right thing to do at this stage instead on blaming x or y as some are doing, is acting as Bertelli: Asking your team what & how they feel about current situation. He has not hide or blame a protocol/rules they have agreed to participate in, there is no room for this now. Dario Valenza has been working hard on his Paradox project. 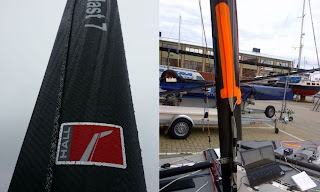 Lots of two boat testing recently plus some modifications on foils. Above a perfect trimmed skimming flight, below the on board video. Hope to see the Paradox racing good at Barcelona if they attend, looking towards the 2014 Worlds in New Zealand. A local made A-Cat is always a key part for any class growth development. Check super smooth airborn transition at 2:09 . All images by Denis Lucci...speaking about being at the right place at the right moment! -- The wait & speculation on when we will have a production beachcat capable of a stable flight is over. 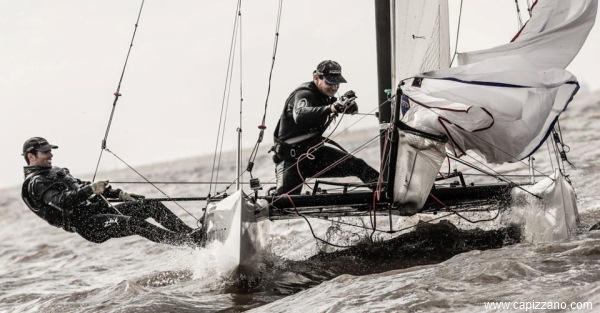 This means that it will win all races/regattas? 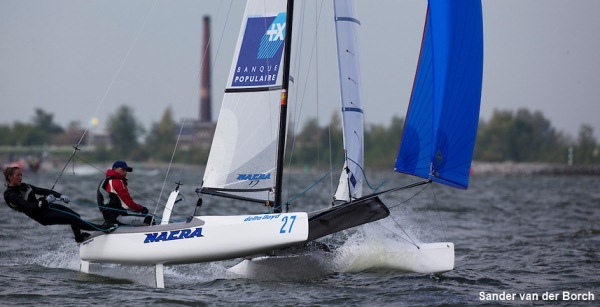 Not yet, as Mischa dominated downwind in the breeze at Hyeres ending with two bullets, but the combined conditions with calms didn´t summed up for winning the event that went to Bob Baier with a Nikita (12yrs design by Nils Bunkenburg). Mischa ended 6th. But of course the combination of Mischa new acquired or transferred skills to the A-Class are helping DNA to have a too powerful racing package. Next events and the European will provide more data on the effectiveness of this Flying mode. Report by Arno Terra from DNA. More info & pics will follow. Image Denis Lucci. 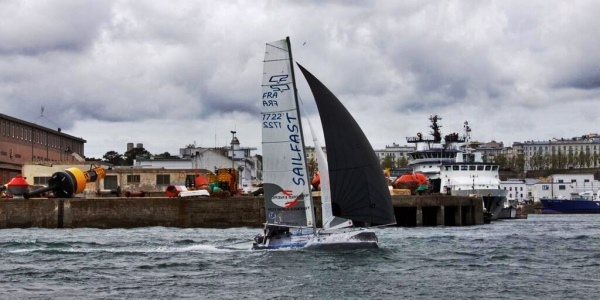 "Although Mischa demolished the fleet downwind in the races wiht a bit of breeze only a few people did see him fly. This pic might even be mistaken for a jump, therefore more pics later in which you will see a stable flight. Roeland and I got a clinic by Mischa last Sunday when the races were cancelled and he taught us how to fly and keep control. If you do it wrong the boat becomes a wild animal and you start making aggressive jumps. If you do it right you can control the boat easy in 24 knots of breeze. It is unbelievable how well we could control the boat downwind. Flying makes life easier and the current wind limit becomes a joke. 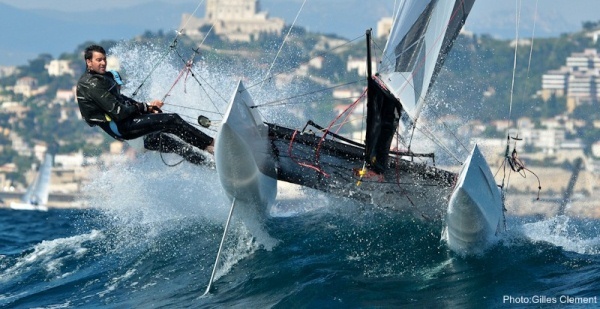 You have to adjust the way you sail downwind but then you can control the height/heave with steering and sheet tension. If you do it right you will sail 10-15 degrees deeper and beat the angles of an F18." Also that a special expert committee will review facts to provide further recommendations. All 4 teams confirmed to be willing to go on. On the actual events, they said they are waiting for the Police report, so they don´t to get any info out before them. The Coast Guard will continue to support the event, and they still must provide the permit for the event to take place. Some interesting concepts were exposed on the conference that are somehow a lead on things to come. 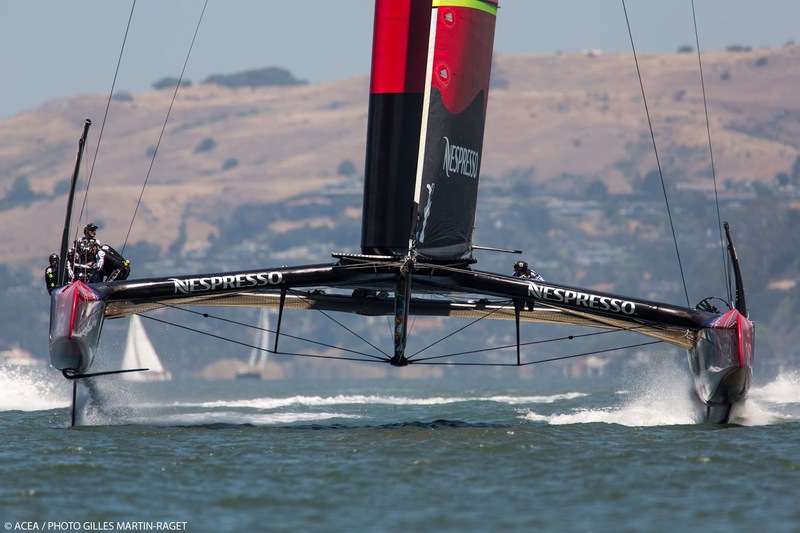 Specially Ian Murray's point on the AC72 rule box, and how all boats are different, and how the teams manage their design / structural decisions. This is something that can be said now, the AC72 are maybe too big, but it is fair to say how ETNZ have been testing and training to date with no major issues. Assigning responsibility to the organization I think is not right, it is the same analogy on us sailors wanting to participate or not. So no one forced any team to enter this Cup, and being a rule box the organization cannot be responsible for each team decision and work plan. Can smaller cats be raced in the A Cup? 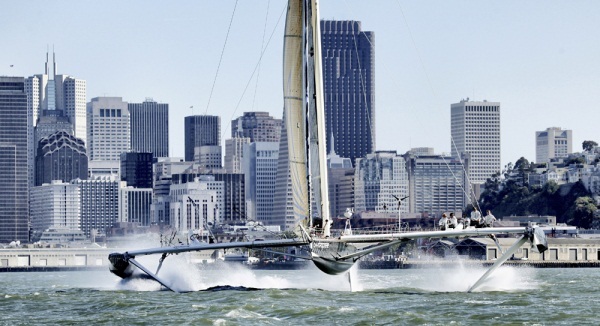 of course, the AC45s have put on a show. 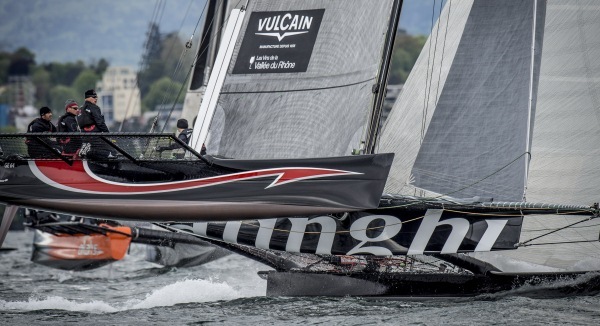 But right now as remarked in press conference 7 AC72 were built and is the intention of the 4 teams , as per Tom Ehman & Murrays confirmation, that they are willing to race and continue participating in this Cup edition. 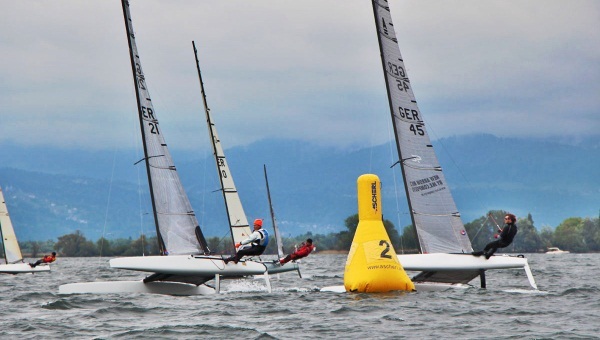 On the RBYAC it was confirmed that the German Federation don´t want to participate, but they indicated that the actual youth team still wants to race. And they also confirmed that there are several teams, as I wrote today, willing to participate if the Germans are out. The Coast Guard Captain also pointed as we all know, is impossible to prevent a 100% issue free event in the sport of sailing. But that is no excuse of course to review any failures in all areas, technical, rescue and so one to gather info to be passed as feedback to other teams and to be used as a learning process to provide the best assurance to the most important asset of this event, that of course are the sailors themselves. I hope again, that Artemis can be able to participate in good shape, for Andrew Simpson crew mates to honor him in the best way possible. Needless to say with sufficient guarantees on their safety on board plus adequate support logistics. 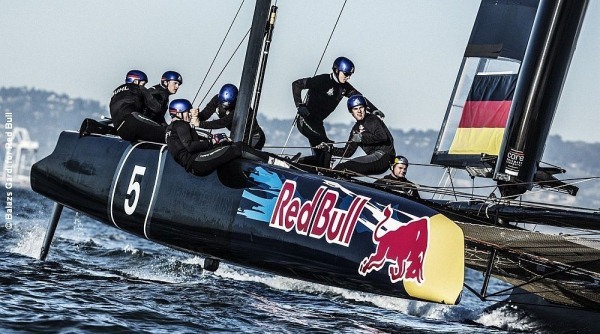 RBYAC: Germans out... Who is in? It seems that the German Youth team has cancelled their participation on the Red Bull Youth Americas Cup on safety doubts . This is part of the self responsibility sailors have when entering or not a regatta, to put themselves in x situation or not. It is their right and of course part of the rules. F18s , Tornado, N17 , F20c and others can reach 20knots of speed, pitchs are hard and you put yourself in some hairy situations in the breeze. 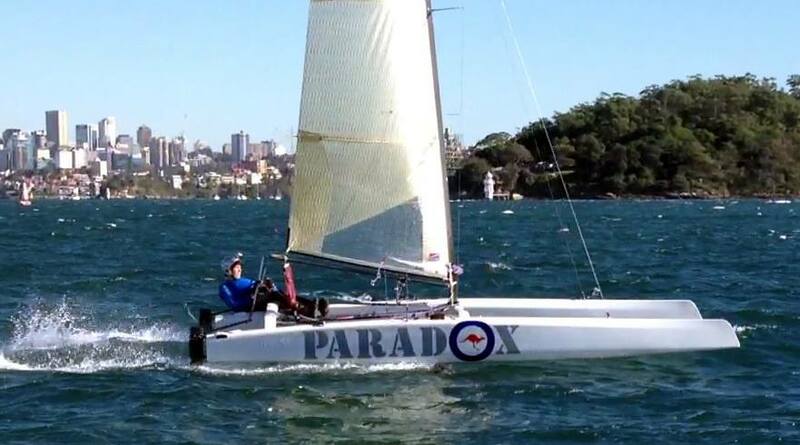 A Tornado sailor died in an Olympic trial event after capsizing and getting trapped with his harness and boat lines. Quick release systems are now a must. 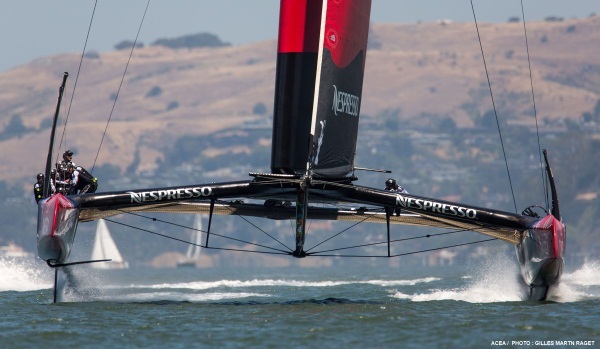 In 1999 Americas Cup training a sailor got a deadly hit on a hardware failure. I've seen supposedly safe Americas Cup boats breaking in two and sinking, dismasting and more while racing , and the list goes on. So there is always a risk while going out beyond having a perfect contingency plan. With this said I'm sure some other teams will be eager to participate in their place. 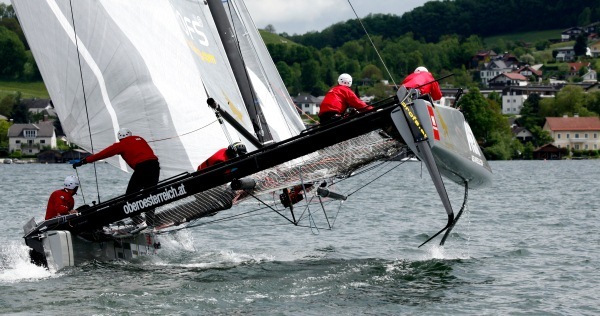 The AC45s have been racing for years now, and have shown to be pretty reliable in any condition. 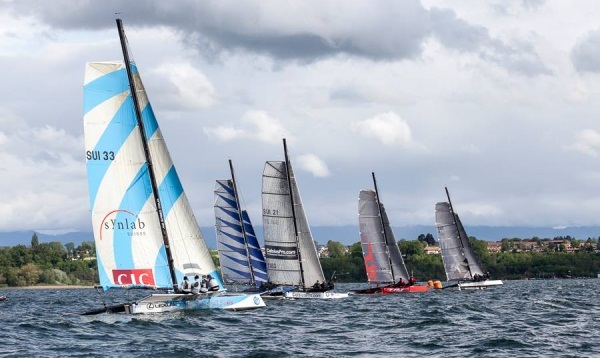 I think is still a viable event with additional security & logistic measures that an event of this size should and can guarantee and maybe some upper wind limits as is going to blow more than the trials. The other day I sent a message to a member of the team with just 2 lines showing my support, and remarking that if they decided to continue it was going to be the best way to honor Andrew. "There are good days and bad days. Then there are days that are truly dreadful, when all the optimism and progress you have nurtured is broken and lost. When this is compounded by the death of a beloved comrade, the loss seems unbearable and will test the limits of faith and endurance. 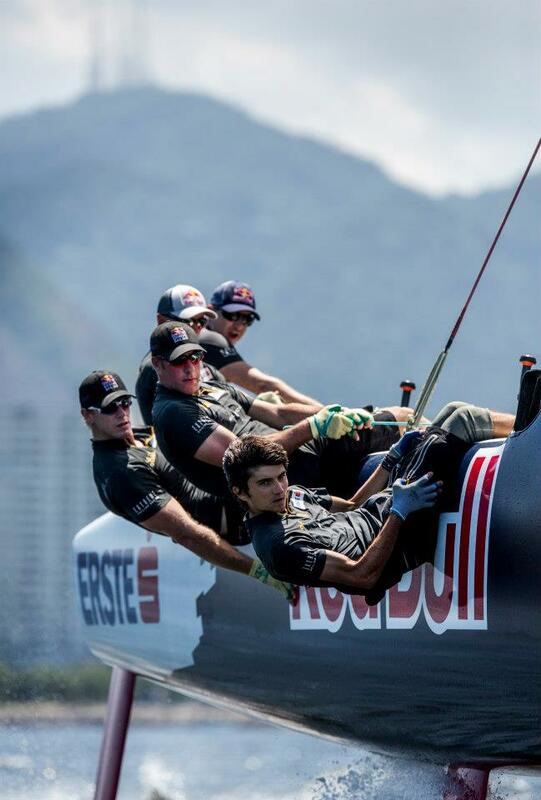 Artemis Racing is at a time that will tax their characters to the limit. We wish them all the strength and sprit to endure, recover and overcome. "The description of the accident in the Newcastle Herald while quoting my father is not correct and does not reflect the facts. Unfortunately it has been relayed by other media. Right now, we are all still mourning and working to understand what happened. I hope everyone can respect this and I thank all those who have expressed support." 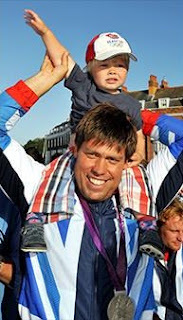 I've been trying to find the right words to write something about what happened, but I desisted after reading some bitter people and finger pointing as their first reaction, forgetting about the real important thing these days, that was only showing some respect and remembering Andrew Simpson while supporting his family, crew mates and basically all the sailors and professionals involved in this Cup. Behind the scenes a detailed investigation is taking place as informed. Main goal should be knowing what exactly happened and analyzing how to try to prevent or minimize this in the future at every level of the sport. After knowing the real facts we can express our views on technical matters and what path to follow. Writing about technical and sport details on a top level event like the ACup is a thing, but when someone dies, the critic and opinion game is over. Plenty of time to assign responsibilities if any, plenty of time to criticize or to decide what to do next. Lets waits for the official facts. At least I can´t start writing & speculating on the circulating rumours. For now lets remember Andrew Simpson with respect. Very few people I didn´t knew got me shocked with their death, Ayrton Senna was one and now Andrew Simpson. When I was a kid a Duke's phrase got my attention "One day I'll catch a perfect wave and just keep riding..."
Really a sad day for Sailing. More info to come , lets wait for official info regarding injured crews. Rest in Peace Andrew, my prayers with you and your family. Event starts today, 36 boats. I didn´t found the inscription list, but if Besson-Lagarrigue (photo above at 2010 nats by Gilles Clement) are in, they are my bet for the title. For Dark Horses the Bellet bros.
- Sunday 12 : 10 h00 2 à 3 Races (pas de départ après 14h) – Results & Prize Giving. 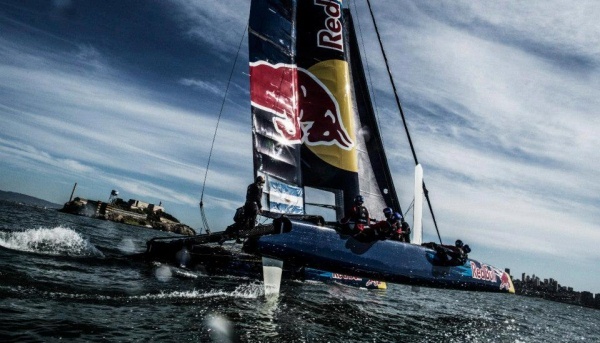 Pierre Le Clainche, 2x F18 Youth World Champ along Antoine Joubert, and currently racing with Red Bull on the ExSS, suffered a bad injury while training at Qingdao for the Extreme Sailing Series. 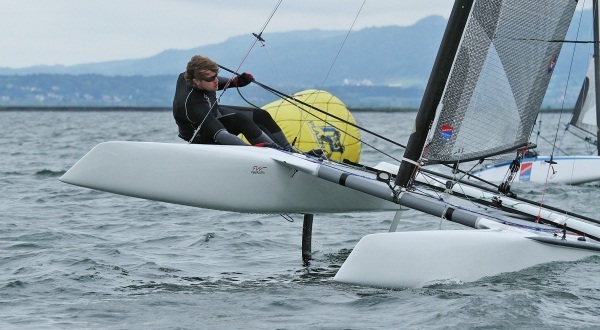 Really sad news on young sailor that is creating his path right from our own Formula 18 Class. Just contacted him and he told me got several injuries on the ExSS training day in Qingdao. 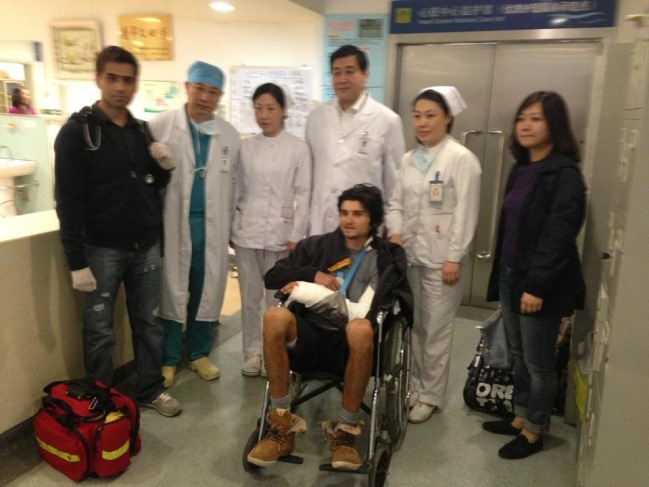 "My left arm was damaged in a bad way and nobody can say if I''ll use it again on the future. He is on Hong Kong airport in transit to Paris. It's a bad shift but I'm getting ready to fight hard and to come back very soon. I'll let you know as soon as I'll have new updates from Nantes Hospital." 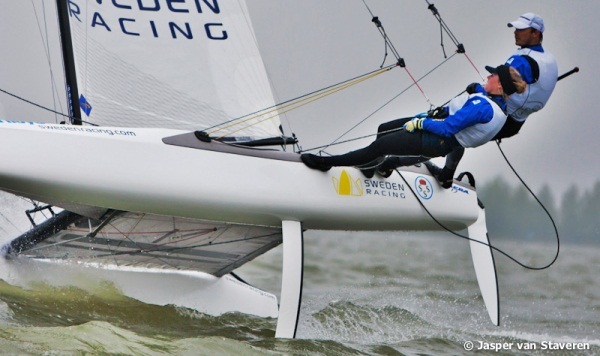 Pierre, I wish you a promptly recover, all the best from the Catsailing community, you'll come back even stronger.